Probably best on the market. Antifouled in December 2017 into dry storage. Just returned from La Coruna Spain in September 2018, this yacht is probably the best example on the market and ready to continue passage making. Refurbished in April 2016 including new standing rigging, new roller furler, refurbished mast, full engine service, new removable inner forestay, anti fouled and polished. Wind steering system is available, but needs refurbishment. The Victoria 34 is a modern classic, a traditional styled cruising yacht with a very high quality build and fit-out. Shortly after the design was introduced, 'Yachting Monthly' reviewed the boat and commented "....Conservative through and through, she is deceptively fast and powerful too. " Designed by Chuck Paine, a robust sea-going yacht , the Victoria 34 has a longish shallow fin keel and a strong skeg-hung rudder. 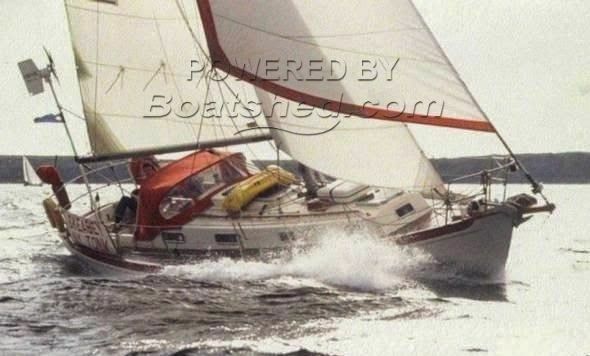 The boats were built to Lloyds specs, with solid GRP hulls and was in production from 1985 to around 2000. Recently reduced she will not be on the market for long. This Victoria 34 Cutter has been personally photographed and viewed by Phil Key of Boatshed Torquay. Click here for contact details.